I think I may have mentioned before how much we love coffee in our house. It is not unusual for us to go through 2 pots of coffee a day - and if we plan on staying up late, a 3rd may be brewed. How do we not go into caffeine-overload? I have no idea. The thought crossed my mind the other day about fruit-flavored coffee. Although I have seen fruit-flavored ground coffee, I have not seen any fruit-flavored creamers. Perhaps this is because it would be gross? I don't know, it sounds good to me. You see, I am a self-proclaimed "Coffee Creamer Queen" - I try all the flavors and get completely, ridiculously excited when a new one comes out. The only flavor that my taste buds have scoffed at is Amaretto, everything else is good in my book. This drink is so easy to make and such an awesome way to start a warm summer day. 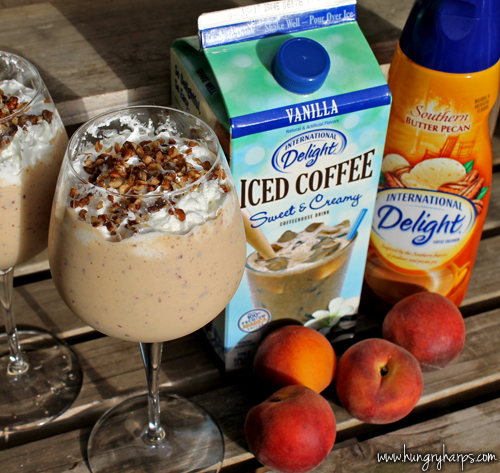 We sat on our back patio, listened to the birds chirp, saw the sun come up, felt the early coolness of the day - all while enjoying a Pecan-Peach Coffee Smoothie. Everything together made the moment scream, "Summer is here!!". Do you remember those carefree days of summer as a kid? It took me back to those days - what a fun feeling! 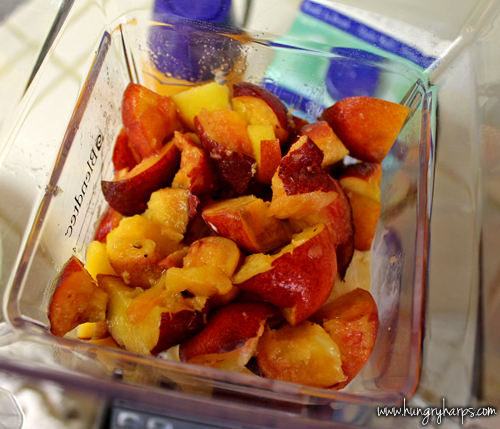 Since I can't keep anything a secret, let me share with you how to make this fruity concoction! 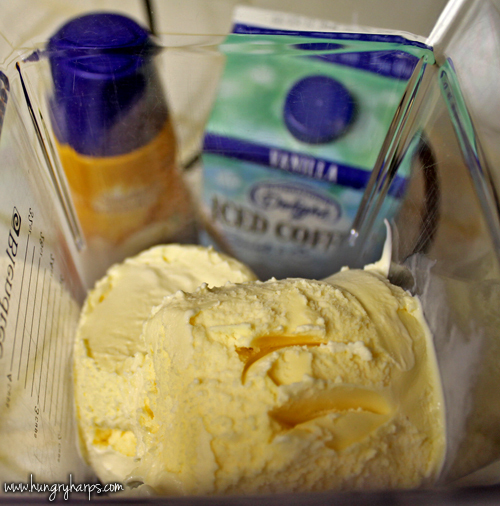 First, 2 cups of ice cream. I chose vanilla to keep it simple. 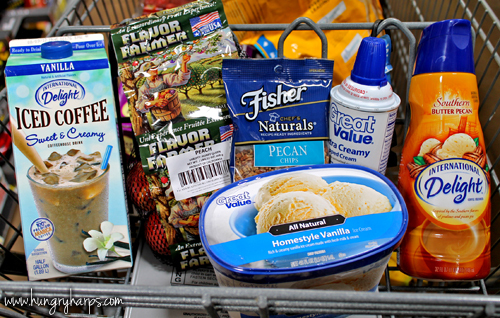 Then, add 3/4 cup International Delight Iced Coffee Vanilla flavor and 1/4 cup International Delight Southern Butter Pecan coffee creamer. 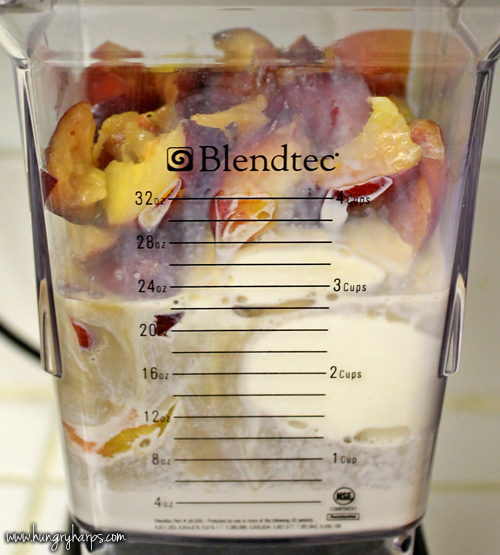 Blend all ingredients until fully mixed. Also, between June 21st and July 4th, International Delight will be giving away 1,000 free cartons of their Iced Coffee everyday! Very cool, and if you win, I just ask that you have me over for a cup of coffee. ;) Check out their Sweepstakes Page on Facebook for more details. Good luck! Wow. I love peaches and cannot turn down pecan pie. 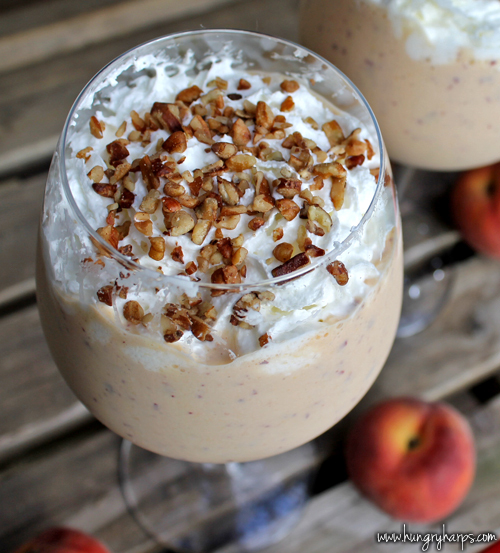 Best of both worlds in a smoothie!